Housing association worker Elaine Brotherstone hands over the keys to Sandra McHutchison's new home in Stonefield Place in Hawick. The £11m regeneration of a once-blighted Hawick housing estate is moving on apace as 27 tenants received keys to their new homes this week. The Stonefield Estate was built in the 1960s and consisted of 25 low-rise blocks made up of 205 predominantly one-bedroom flats. Ollie Turnbull, four, with his granny Anne Devine and housing association worker Elaine Brotherstone in Ollie's new home in Stonefield Place in Hawick. However, by the end of the 2000s, the estate was in need of major regeneration, with many of its flats sitting unoccupied and frequent anti-social behaviour problems becoming an issue. 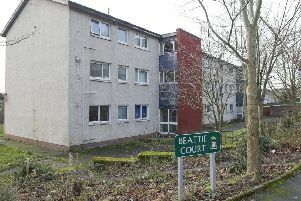 The project to revive the estate has been led by Scottish Borders Housing Association in partnership with Scottish Borders Council and Waverley Housing – and tenants have been involved in the transformation every step of the way, they say. Consultations were held to ensure that the revamped estate met their needs and wishes for their new homes. Tenants sat on a steering group at the planning stage and a new residents’ association was established to highlight their views. The latest new homes to be made available incorporate energy-efficiency features including solar panels and water butts, making them economical to heat. The project has also seen the refurbishment of 53 flats, and a further 10 new-build properties were completed last year. Julia Mulloy, chief executive of the association, said: “We’re delighted to welcome tenants to their new homes. “This work has reinvigorated the community in Stonefield, and we’re pleased to see both the flats and the new builds have such a demand and are so popular. Among the new tenants is Sandra McHutchinson, 70, and her husband Ian, 72, currently renting a property in Hawick’s Ivanhoe Terrace. They have been presented with the keys to their two-bedroom property in Stonefield Place and will be moving in next week. Sandra said: “We can’t wait to move in. The houses are absolutely lovely and superbly designed. We have already met some of the neighbours, and they seem lovely too. “It’s somewhere we can imagine ourselves living for many years to come, and it’s wheelchair accessible, so that’s something to think of in the future, although hopefully not for a long time. “My husband grew up in Lynnwood, and he knows all the local walks where we can take our Border terrier dog. “Scottish Borders Housing Association has been great with us, and we were notified we had the property within two weeks of applying. The estate is offering one, two and three-bedroom flats and three and four-bedroom affordable homes for rent. The first phase of the development, granted planning permission by the council in April 2013, was completed last year.